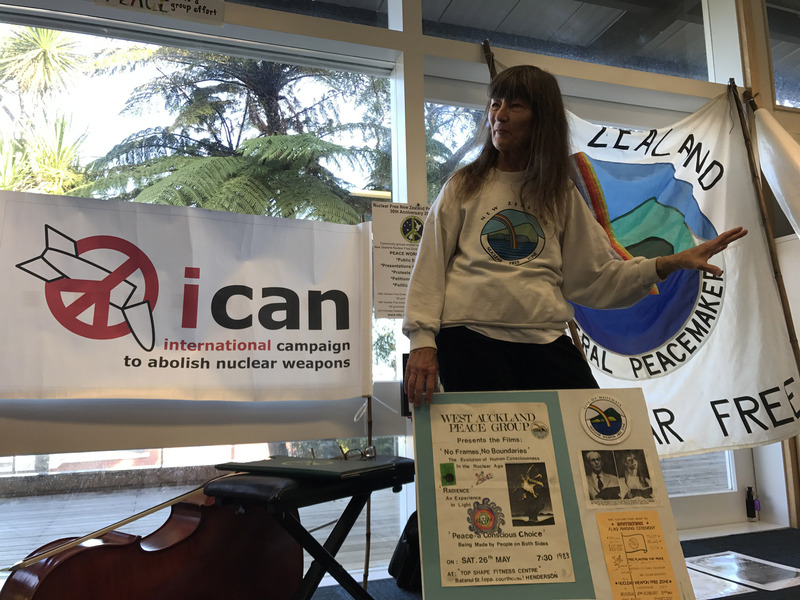 I was asked to speak last week at the West Auckland Peace Group’s meeting to celebrate 30 years of our nuclear free legislation organised by the legendary Laurie Ross. The event started with the quality music of Heartstrings and then Laurie and I both spoke to a small but very informed crowd. I was born in 1961 during the heights of the cold war and a year before the Cuban Missile crisis in 1962. And I can recall my father telling me at that time how he had left work and gone home to be with my mother my sister and me such with the fear that nuclear war was about to start. And for most of my life the threat of nuclear war has been this big threat hanging over me. I am in a reasonably unique position to comment on the nuclear legislation. David Lange was a family friend for many years. My family have been long time Labour supporters. My father has two gold badges, one from the Engineers Union and one from the Labour Party for services to the movement. He has been a long time activist in Mangere. The head office preference was for Mike Moore to be selected. There were 11 candidates however and the selection meeting went well into the night. The last speaker was a youngish very overweight lawyer called David Lange. And he delivered a speech which blew away the crowd. The committee was split between Lange supporters and Moore supporters. My father decided to change his support to Lange and the selection was completed. Given the way that New Zealand history went his decision that night clearly had a significant effect. Labour always had a deep interest in nuclear policies. It was at the forefront of efforts to create the United Nations so that disputes between states could be handled peaceably. In the 1970s the third Labour Government sent two frigates, one with Cabinet Minister Fraser Coleman on it, to the test area where the French were conducting atmospheric tests of nuclear bombs. The French subsequently decided to conduct underground tests before finally stopping tests in 1996. Labour proposed the nuclear free policy in 1984. In fact Richard Prebble introduced a Nuclear Free bill in June 1984 and National MP Marilyn Waring supported it. This was possibly the last good thing that Prebble did during his time as a politician but good on him for doing this. This actually appears to have been the trigger for Muldoon going to the polls early. He only had a majority of 1 MP and could not face the disaster that a lost vote would cause. The policy was popular. In an opinion poll conducted just before the 1984 election 30 per cent of New Zealanders supported visits by US nuclear warships with a clear majority of 58 per cent opposed, and over 66 per cent of the population lived in locally declared nuclear free zones. Then the stand off with the US started as did a big world wide debate on the nuclear arms race. The US was fearful that a nuclear weapons ban could spread throughout the world and they were right in that was the intent no matter what Labour MPs were saying publicly at the time. Who can forget the Oxford Union debate when he said that he could smell uranium on the breath of an over eager conservative. And Lange had a fearful intellect and an ability with the English language that was second to none. One phrase that still sticks with me that perfectly describes the insanity of the arms race is his comment about refining an existing capacity to make the rubble bounce and bounce. I understand that behind the scene pressure on Labour not to proceed with the policy after it was elected was intense. There was an early show down where the US ship the Buchanan was proposed for a visit. After a certain amount of wavering Lange said no. The right in Labour’s caucus wanted the visit. The rumour is that his then girlfriend Margaret Pope steeled him up and he said no. After that relations with the US cooled off considerably. But the problem for the US was that the policy was that goddamed popular. A 1986 opinion poll confirmed that 92 per cent now opposed nuclear weapons in New Zealand and 69 per cent opposed warship visits; 92 per cent wanted New Zealand to promote nuclear disarmament through the UN, while 88 per cent supported the promotion of nuclear free zones. Then the nuclear free legislation was introduced and passed in on June 8, 1987. It prohibited the acquisition by, or the testing or siting of nuclear weapons in New Zealand. It prohibited the use of biological weapons. It also prevented ships using nuclear propulsion from visiting. And to address the US’s neither confirm nor deny policy it allowed the Prime Minister to make a call on whether or not he believed there to be weapons on board. Only if he was satisfied that a foreign warship had no weapons on it was he authorised to allow it to visit. The US responded by suspending ANZUS. Ordinary kiwis were totally indifferent to its actions. My impression of David Lange at the time is that he was relishing the debate and he was proud to stand up lead an independent foreign policy. Meanwhile Rogernomics was playing out and to be frank the fourth Labour Government shredded its moral mandate to lead. But I believe that Lange still remained popular because at least he was doing something progressive. National then gained power in 1990. Despite being in power for 18 of the last 27 years it has not touched the legislation despite what must be an overwhelming temptation to do so. In 2004 Don Brash was reported as telling American officials that the legislation would be “gone by lunchtime” if National won power next year. And during the 2005 campaign he did not rule out the repeal of the legislation. This probably contributed to Labour’s win that year because the legislation is still incredibly popular. Then John Key said that changing the legislation was not an option and so it has remained. There was one attempt to weaken the legislation. In 2005 ACT MP Ken Shirley introduced a private member’s bill seeking to allow nuclear propelled ships to again visit New Zealand. The bill was voted down 9 to 107 with even National voting against it. To conclude in my view the Act has had an important role in forming and moulding public opinion on the issue. Being nuclear free is something that pretty well all of us agree with and cherish. The policy is utterly rational. How irrational is it to have a weapons system with a capacity to make the rubble bounce and bounce. And arguably the Act had an international influence and caused more and more nations to question the insanity of the nuclear arms race. The prospects of a global nuclear war appear to be limited although Donald Trump’s election has set the doomsday clock hands moving. And I regret that I would not be surprised if for instance America and North Korea engage in a limited exchange of nuclear weapons. So the disarmament movement has to continue. There is a safe number of nuclear weapons to be stationed on our planet.